Innovative Dentistry is a full-service practice offering cosmetic and restorative dental solutions. Though the office caters to a wide range of needs, it often promotes its specialty services, such as dental implants, Lumineers, and more. For that reason, we created a modern-looking space with a design that appeals to those who equally emphasize the importance of both smile health and appearance. This design is built on a traditional layout with an upper navigational bar and a header image. An introduction to the practice follows, along with an explanation of the types of advanced technology offered to patients. We implemented an image-based menu of services within the home page, which redirects to other areas of the website. The remainder of the site focuses on the office, staff, and services, as well as a patient education area. For this website, we chose shades of brown and orange fading into gradients of gray and purple. The colors provide delineation between the various areas of each page, as well as a unique color scheme that stands out when compared against the sites of Innovative Dentistry’s local competitors. Brown and orange are both neutral tones that soothe and comfort. We made sure that all the colors on the website would cater to an audience of all ages. Today’s web users are looking for a multi-faceted experience. More than just text, they also enjoy getting information from videos. That is why we included both articles and videos on this website so that users could view information in a way that suits them best. We softened the appearance of the website with the use of curves and by implementing a personalized logo at the top banner. Innovative Dentistry is very active on social media. In fact, Facebook and Twitter are among its most powerful tools for reaching new and potential patients, as well as staying in contact with existing ones. 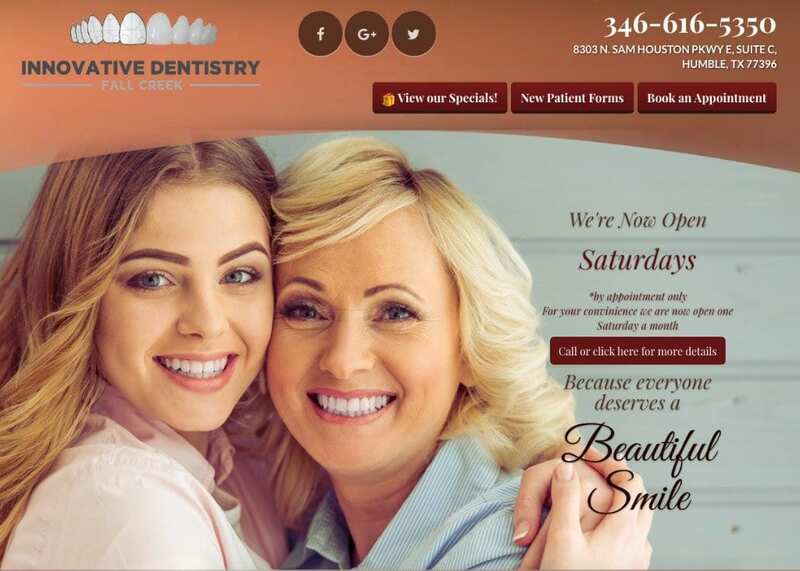 For that reason, we prominently displayed the practice’s social media links at the top of the home page, encouraging visitors to click on them and follow the practice. We also included a smile gallery, where the practice can give visitors an idea of the types of results real patients get through cosmetic and restorative treatments offered at the practice. This website exudes elegance and class. We included several images of individuals, from teens to senior adults and all ages in between. That is because Innovative Dentistry has something to offer to nearly everyone, from those looking for general oral care to those looking for a complete smile makeover.